This post contains affiliate links, , but as always, the thoughts and opinions expressed here are our own. You can read more at our Legal & Disclosures page. Thank you! When Cole was a baby, we went on a lot of trips. Before he was a year, he’d flown to Seattle, New York, Baltimore, and Hawaii twice. And generally, it went really well. 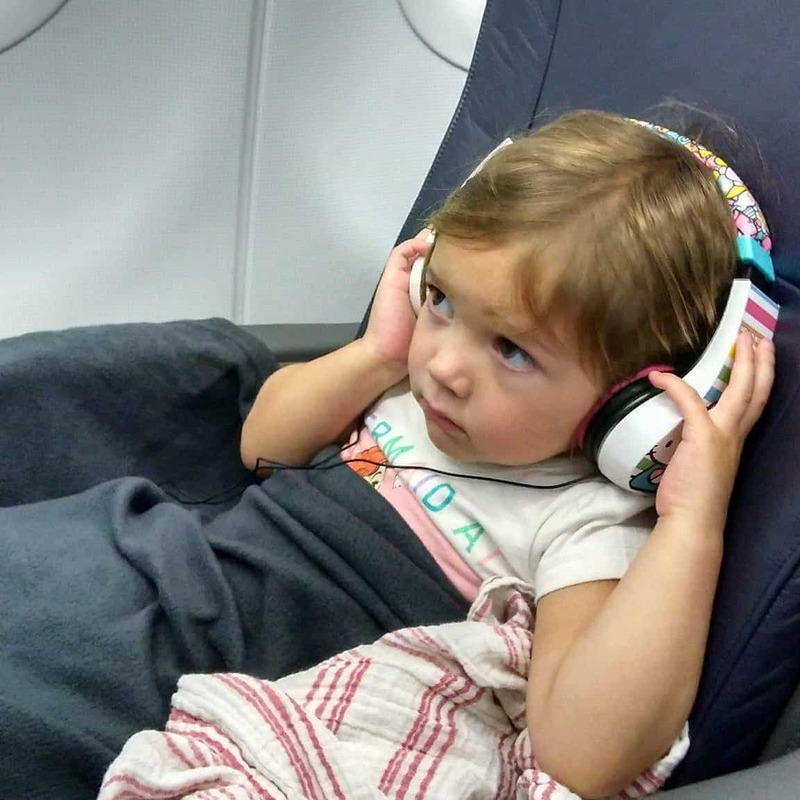 Then we had Evie, and when she was about 4 months old we decided to try a flight as a family of four. But after a 45 minute flight to Reno, we swore off air travel. It wasn’t for us. We would drive, we would cruise, but there was no way in hell we were getting back on a plane. As a family of 5. It was time to get strategic. This isn’t a simple toss a baby in an Ergo, bounce and provide snacks type of production. 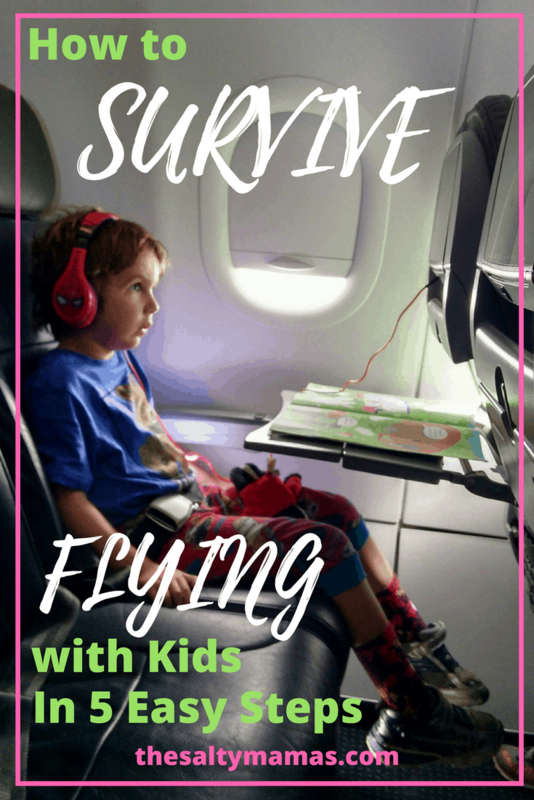 And lots of the tips for road tripping with kids is applicable, but a plane has all. Those. Other. People. So here are plane specific tips for traveling with your band of misfit monsters darling children. Abandon any firm stance you have on screen time. We’re “those people.” Our kids watch TV, we’re not monsters, but they have no idea how to use a tablet. They don’t know that phones hold magical games. The fanciest thing they think they can do on a phone is scroll through old pictures I’ve taken, or maybe use Snapchat on Auntie JJ’s phone. But on a plane? Maybe there are special games you can get ONLY when you’re on a plane! We’ve turned it into something special and made a big deal about that part. I had new headphones for the kids, wrapped like a present for them to open as I announced that the movies are never-ending! If you want to sit nicely glued to your seat and watch movies for the next six hours? I’ll love you forever, sweet child. You’d be amazed at how quiet a kid can be while enjoying a Dum-Dum. Bring one thousand. One flight of non-stop snacks won’t trigger early onset diabetes. So make it like a special thing that happens only on airplanes if you want, but do not ignore this tip that may save your life. Don’t forget the return trip! I feel SO accomplished when the bags are packed, we’re ready to go, and all the kids activities are organized. We arrive, all in one piece, and I give myself a nice pat on the back. Then I realize, “Oh crap, we have to fly home and do this all over again!” Unless you’re moving to where you’re going, you’re going to have to deal with this reality. My strategy? Hide half the haul from the Dollar Tree. Don’t even let your kid know it exists. Pack it in a checked bag if you don’t want to be tempted. Kids love a shiny object they’ve never seen before – and by the flight home they’ll be onto you, so save something extra special for that if you can! Having said that – in case of emergency, use EVERYTHING. And then pray/wish on a star/find a lucky penny/rub a rabbits foot – DO IT ALL. Because even with all these tips you can probably use all the help you can get! And lest you think this is all theoretical? I sat on a tarmac for three hours with all three kids and then flew six hours this week – and at the end of all the lollipops and paint with water books and movies? We got mad compliments from the people surrounding us. And not because I’ve got great kids, but because their Mom was hella prepared! Getting ready to fly across country with kids is like going to battle! Make your job easier – and the flight more enjoyable – with these 5 easy steps! We once took a 20 hour road trip. Being hella prepared is the only way to go. They won’t get diabetes and cavities from eating a bit more sugar and chips than usual. Movies are essential. I’m still not sure how we survived our own childhood without movies in the car/plane/train/etc… I love the idea of using the magnetic cookie sheets! When my first two were 7 months and exactly 2 years old, we did a 30 day road trip/Alaskan cruise/more road trip vacation. It was INSANE. But we survived, mostly because at some point we became immune to their screaming I think, haha! And I think I survived on books and homemade mix tapes in my Walkman! Wiser words were never spoken. Thank you so much for the tips! I would never have thought of the cookie sheet!